When talking about art, most people will just assume that we rely totally on one sense – sight. The message has been that if you can’t see, you can’t experience art. But Penlee House are working to challenge this perception. 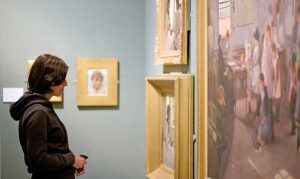 With their exciting new project they aim to work closely with local organisations to welcome blind and partially sighted members of the community to the gallery. Being visually impaired generally means exclusion from all but the major galleries. However, increasing opportunities for partially sighted and blind visitors to engage with and enjoy heritage and arts and culture is an integral part of Penlee House’s future plans. The goal is to develop a programme of audio described tours of the collection, provide training for staff and volunteers in sight loss and visual impairment awareness, and commission raised drawings to further enrich the visitor experience. Next year Penlee House will look to run a series of art/crafts workshops, delivered by a visually impaired artist to help develop the creative skills of blind and partially sighted people, as well as inspiring and engaging them through the collection. We hear the cry – but how are they going to fund this? Earlier this year the Friends of Penlee House were nominated by the staff at their local Co-operative branches to be one of 3 local organisations to benefit from the Co-op’s Local Community Fund. In the 6 weeks since this launched over £1500 has been raised, the hope is that by the end of the fundraising project in March 2017, the Friends of Penlee House will have raised enough funds to fully support the project. Penlee House will be bringing an innovative service to their local community: improving long term inclusion and engagement, developing skills and appreciation of the wonderful art available in Cornwall and arguably improving the health and well-being of an often excluded part of our community. The Friends of Penlee House have demonstrated how working with corporate partners, who have shared goals, can benefit museums and communities, and how by diversifying their fundraising they have been able to fund a creative new project in a way that meets local needs.